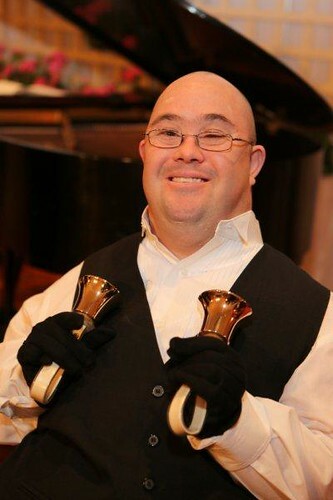 People with disabilities can make beautiful music with handbells. Don’t believe that? Just listen to the Brookwood Handbell Choir! Located on a beautiful acreage west of Houston in Brookshire, Texas, Brookwood is a God-centered, educational community, where adults with special needs have meaningful jobs and live life abundantly… without government funding. The Brookwood Handbell Choir is composed of 16 citizens who have mastered playing music with colored scrolls and a set of 3-octave handbells. The system was adapted from the Handbell Musicians of America under the leadership of world renowned pianist, Linda McKechnie, in 2007. Our Choir practices weekly, performing folk, worship and arranged music from noted handbell artists. The citizens in our Choir range from 30 to 70 years old, with no musical backgrounds. They enjoy playing in the choir because of the team effort, self-worth and feelings of accomplishment they receive from performing. Their Choir Director, Joyce Henderson, founded the group, also without any former musical training. Since then, she has invested a great deal of time and effort in learning the chords, beats and measures and even rang in a handbell choir herself! The Brookwood Handbell Choir has played for numerous churches, senior groups, private luncheons, and the Houston Astros – where they rang the National Anthem! Their most recent performances include ringing for the Houston Grand Opera, the Houston Symphony, the Brookwood Spring Gala and the Brookwood Volunteer Benefit Luncheon. They also perform regularly at Brookwood for many special occasions. For more information, contact Kevin Coleman at handbells@brookwoodcommunity.org or at 281-375-2170.